A new Factory of the Future call for funding has been launched by the European Commission worth over 150 million EUROs for innovative research projects. As partners in the CloudSME project we are members of the European initiative I4MS, which is a £50 million initiative to research systems and tools for simulation to improve the performance of manufacturing SMEs. Visit the I4MS website here. Visit the CloudSME website here. Our new Clean Area has been completed and it includes inspection equipment. We have the latest computer aided design software – the IMPACT software suite which provides us with the latest design tools and libraries, making our lead times even faster. The MANUFUTURE initiative has proposed a new roadmap for the future of manufacturing in Europe, proposing new priorities and technological advances. The annual MANUFUTURE conference will take place in Luxembourg November 2015. Find out more here. As part of our investment programme we have upgraded all of our ICT systems and have purchased more automated Manufacturing equipment. The Extreme Factories Project has been successfully completed. This Research Project, part funded by the European Commission developed an innovative product design tool for Manufacturing companies, and involved a budget of £3 million with 10 partners from 5 countries. We are partners in the £4million research project “CloudSME” which is developing a cloud-based solution to provide low cost simulation software to Manufacturing SMEs. We will be presenting the CR process simulation software system at the Zaragoza International Congress on Manufacturing Simulation on 24 June 2015. We're pleased to announce the launch of our new website, which has been developed to provide you with better information about our die cutting products and services. 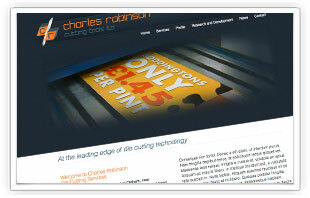 Our new site has been developed by local advertising agency Cornerstone Design and Marketing, and now helps better reflect the wide range of products and services available from Charles Robinson Cutting Tools. Extreme Factories EU research project has achieved significant results, reaching its validation stage for the innovation platform software tool. Cutting Tools are partners in the consortium and are providing the assessment and validation for the state of the art project results. Thank you for sending our new die cutter last week, it is perfect and works a charm! I just wanted to say a personal thank you to you, your customer service has been excellent and you have been very helpful throughout. It was a pleasure doing business with you. We are partners in the £5million research project “CloudSME” which is developing a cloud-based solution to provide low cost simulation software to Manufacturing SMEs. All Content Copyright 2012 - Charles Robinson (CUTTING TOOLS) Limited. All Rights Reserved.